OMAHA, Neb. – It all came together for the young Husky volleyball team tonight, and a stunning 3-0 sweep of No. 9 Creighton put Washington back into the Sweet 16 of the NCAA Championships for the sixth time in seven seasons — but this one might feel the sweetest. Washington rode a dominant blocking effort to snap Creighton’s 21-match win streak and sweep the Bluejays, 25-19, 25-21, 25-23, in front of 2,509 fans at D.J. Sokol Arena. 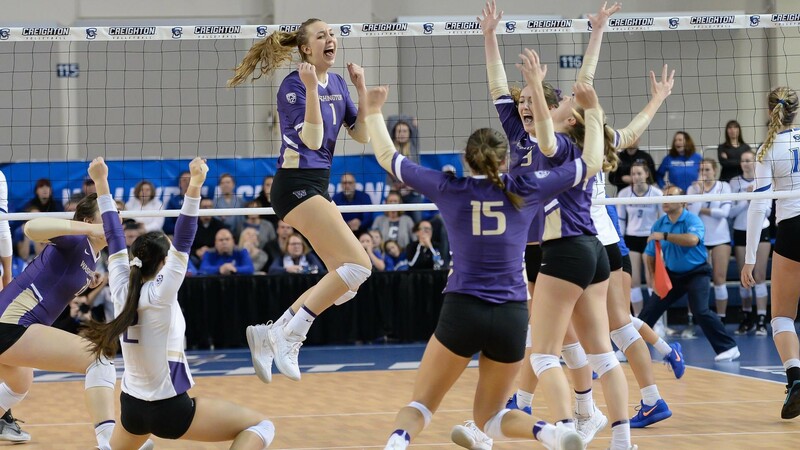 The unseeded Dawgs endured a five-match losing streak during Pac-12 play and finished at just .500 in conference play, but Washington’s willingness to remain positive and continue to work day-in, day-out, paid off with their best performance when they needed it most. The Huskies (20-12) are now off to the Regional round for the 14th time in school history. The Dawgs had a five-year run of reaching the Round of 16 from 2012-16 before falling in the second round last year. Despite losing seven seniors from that squad, the Huskies now find themselves one round farther. They will face eighth-seeded Penn State next Friday, Dec. 7, in Palo Alto, Calif. as the Cardinal will host the regional. Head Coach Keegan Cook, reaching the Round of 16 for the third time in his four years, said, “We knew Creighton was an outstanding team, and I walk away even more impressed than I was watching them on film. Just the number of times they fought back, especially in that third set, and put pressure on us, really impressed with the program here. Washington hit .240 against the Bluejays but held Creighton to a .113 percentage thanks in large part to 14.5 team blocks. Sophomore Lauren Sanders had eight of those including two solo, and she also put away seven kills on a .600 attack percentage. Sophomore Samantha Drechsel also was in on six blocks, and she led the offense with 14 kills while hitting .312. Junior Shayne McPherson had 20 digs including 14 in the third set alone, and she served the crucial end of the third set, when the Huskies were down 20-23 but then reeled off five points in a row to suddenly close out the victory. All-Pac-12 junior Kara Bajema had nine kills, nine digs, and three blocks, and freshman Ella May Powell set 35 assists and added six digs and three blocks. SET 1: Claire Hoffman hit down an overpass for UW’s first kill of the match to make it 1-1. Sanders put a slide away from Powell as the Dawgs trailed by one, 4-5. Bajema ended a nice rally with a solo rejection for 5-all, and then Powell poked a rebound through the block for a 6-5 lead. Samantha Drechsel hammered her first two kills as the teams were even at 9-9. A 3-0 Husky run put them back up, 12-11, on a Destiny Julye ace. Julye had a kill out of the back row for 14-14. Creighton served its fourth ace of the set to take a two-point lead, 15-17, and the Huskies called their first timeout. Out of the break, Niece tipped for a kill and then Drechsel and Niece met up for a rejection to tie it at 17. Hoffman then tooled the block for a third-straight point and Creighton took time at 18-17 Dawgs. Hoffman put another down for a 20-19 lead. Sanders then ended a scrambled rally with a big solo stuff in the middle and on the next Creighton swing, she and Drechsel teamed up to stuff another for 22-19 and the Bluejays used their last timeout. McPherson’s serving run wouldn’t be stopped, however, as Sanders and Drechsel stuffed a third in a row out of the timeout, then McPherson floated an ace to the back line to reach set point. McPherson’s next serve was shanked for another ace as the Dawgs closed the set on a 6-0 run to win it, 25-19. The Huskies hit .333 in the set and held Creighton to just .067 thanks to the five big blocks, three from Sanders and three from Drechsel. SET 2: The Huskies opened set two with a Drechsel kill and then another block, this one by Hoffman and Niece. Drechsel and Hoffman put away big swings for a 5-3 Husky lead. Sanders added two more kills on the slide and then had a booming rejection for a 10-5 Husky lead and Creighton took time. Washington got its next three points all on blocks as they maintained a 13-9 lead. The Bluejays got a couple back and UW took timeout up 13-10. Drechsel had a finish from the left out of the break and after a Creighton point, she had another on the right for 15-11. McPherson dug a blast and then Sanders and Drechsel roofed another for 16-11. Sanders buried another slide and then Powell got the most of a stuff for 19-14 and Creighton used its last timeout. Creighton posted three straight points out of the break and forced the Huskies into a timeout leading 19-17. Creighton got one more, before Sanders snapped the 4-0 run with a kill for 20-18. Bogomolova then dropped in an ace for a three-point edge. Bajema got on track with a crosscourt kill for 22-19 and then Creighton missed one wide for 23-19. Drechsel broke through the block for set point at 24-20. On the second set point chance, Powell back set to Drechsel who slammed it through the block for the set, 25-21. The Huskies hit .216 in the set and again held Creighton in check to a .079 percentage, with another huge blocking effort of 7.5 stuffs. Drechsel had seven kills in the set on 12 swings and Sanders put away four of five swings. SET 3: Bajema went off the block from the right pin for a kill and 1-1 to start the third. UW seemed to have a block and started to celebrate, but refs ruled the Bluejays kept it alive and they sent it back over for a kill for 1-3. Hoffman took a tough set off the net and found the far corner for 4-5. McPherson then had a pancake dig and Bajema blasted one into the seats for 5-all. Bajema cranked another off the block for a 7-6 edge. Washington won one of the points of the season to fire up the bench and the few fans in purple as Bajema crushed a kill from the right after an incredible rally, making it 10-8. Drechsel pummeled a Powell backset to the floor for 13-11 Dawgs, but Creighton tied it at 13-13 with a service ace. But UW got a sharp-angled kill from Bajema to take a 15-13 lead to the media timeout. A 3-0 run from the Bluejays tied things up again at 17-17 and the Huskies called their first timeout. Creighton got one more to move ahead, but Niece snapped it with a big kill on the slide for 18-18. But Creighton scored three more in a row, suddenly digging every Husky swing, and UW needed timeout again at 18-21. Drechsel got one inside the block to snap that streak, and then after a McPherson dig, she connected from the right for 20-21 and Creighton took time. Two Creighton points put the Huskies in a 20-23 hole, but Niece got a kill after a touch call was found on a replay challenge by Coach Cook. Creighton missed one wide, and then Sanders got UW’s first block of the set to tie it up at 23-23 and force the Bluejays timeout. On the next point out of the break, it was Sanders who again hunted down a rejection and suddenly the Huskies had match point at 24-23. Another tough serve from McPherson got an easy swing that the Huskies dug, and McPherson then bump set to Drechsel who let fly from the right and put it down to finish it, 25-23, as the Dawgs completed the sweep with a stunning 5-0 run. The Huskies hit .200 in the final set compared to .170 for the Bluejays and Bajema got going with seven kills in the set while McPherson had a huge 14 digs in just the third set. OMAHA, Neb. — The No. 9 Creighton Volleyball team saw its memorable 2018 season come to a close on Saturday night, falling in straight sets in the Second Round of the NCAA Tournament to No. 22 Washington. Scores in favor of the Huskies (20-12) were 25-19, 25-21, 25-23. With the win, Washington advances to play the No. 8 national seed, Penn State, next Friday. Match times and a site will be announced in the next 24 hours by the NCAA. Creighton ends its season with a 29-5 record, tying the program record for wins in a season. The Bluejays had a 21-match win streak, as well as their school-record 15-match home win streak, snapped with the loss. Washington trailed 17-15 in the first set after Madelyn Cole‘s 50th ace of the season, only to respond with a 4-0 run. After the Jays worked to tie the score at 19, Washington closed the set on a 6-0 run that started with a kill by Claire Hoffman, was followed by three consecutive blocks by Lauren Sanders, and concluded with consecutive aces by Shayne McPherson. The Huskies hit .333 in the first set and outblocked CU 5-0. Washington rode the momentum of its opening set win to take control early in the second set. The Huskies got consecutive blocks by Avie Niece to move ahead 13-8 and kept a five-point edge to lead 19-14 before Kirsten Bernthal Booth‘s second timeout of the frame. The Bluejays went to their senior All-American outside hitters to attempt a rally. Two kills from Taryn Kloth and another by Jaali Winters brought CU within two and prompt a UW timeout. A Huskies attack error gave CU a chance to tie before a Bluejay block error and ace from Maria Bogomolova gave the UW a three-point cushion once again at 21-18. Creighton saved one set point before a kill from Samantha Drechsel closed out UW’s 25-21 set two triumph. Drechsel had seven kills and two of UW’s 7.5 blocks in the second set win as the Huskies held CU’s potent offense to .079 hitting. The third set saw Creighton leave it all on the line in an attempt to extend its season. The Huskies led 17-14 before four straight Bluejay points capped by a Kloth kill gave Creighton an 18-17 lead and brought the crowd to its feet. Kloth’s 10th and 11th kills came on consecutive points as CU’s lead stretched to 21-18. UW forced CU’s final timeout after narrowing the margin to one at 21-20, but Naomi Hickman and Kloth closed on a block to make it 22-20 and UW hit long as CU’s lead grew to 23-20. Washington got a reversal on a challenge, then Sanders had a solo stuff to even the score at 23-all. Another block by Sanders, and a kill by Dreschel saw the Huskies end the match on a 5-0 run. Drechsel finished with a match-high 14 kills, while Sanders had a hand in eight blocks to pace UW. The Huskies hit .240 and had 41 kills, four aces, 48 digs and 14.5 blocks. Creighton had 36 kills, seven aces, 39 digs and eight blocks on .113 hitting. Kloth led CU with 11 kills, and Brittany Witt finished with 15 digs. The match marked the final contest for Bluejay seniors Samantha Bohnet, Taryn Kloth, Kelsey O’Connell and Jaali Winters. The quartet helped CU win four BIG EAST regular-season titles, four BIG EAST Tournaments, and 111 matches over a four-year span while helping the Jays to the program’s first Sweet 16 (2015) and Elite Eight (2016). NOTES: Taryn Kloth finished with 490 kills in 2018, third-most in Creighton single-season history and the most ever by a Creighton senior … Kloth’s 1,427 career kills rank fourth-most in Creighton history … Jaali Winters finished with a school-record 1,843 kills and 5,093 career attacks among more than 80 school records. Winters tied Creighton records for matches started and matches played in a career on Saturday, and also (along with Kloth) has played in more NCAA Tournament sets (44) and matches (11) than any players in program history … Brittany Witt finished 2018 with 510 digs, making her the first player in CU history with three straight seasons of 500 or more digs … Madelyn Cole‘s 51 aces are second-most in Creighton single-season history … Each of Creighton’s three longest home win streaks in program history have been snapped by Pac-12 teams … Creighton finished the season with a school-record 204 aces … Creighton’s 29 wins tied a school-record first done in 2012 and 2016 … Creighton is now 10-8 all-time in eight NCAA Tournament appearances, including a 2-2 mark at home and a 2-5 record in the Second Round … Creighton’s 21-match win streak was snapped. It was second-longest in program history and the third-longest active streak nationally.